It's time to take that long anticipated trip to New Mexico: blue skies and drying chili peppers swinging in the breeze, Canyon Road and silver mesas in morning sun, turning into gold light pouring into evening. September brings Art Trek open studios when I return: September 24-25; a preview party at the Upstairs Artspace on September 23 from 5-7 p.m. All participating artists will have work displayed in the gallery until October 14. I'll have sculpture, paintings and more at my Art House. If the weather is good, paintings will be displayed in the front Japanese maple/fish pond garden, on the front porch, and on inside the house. Welcome to my world! 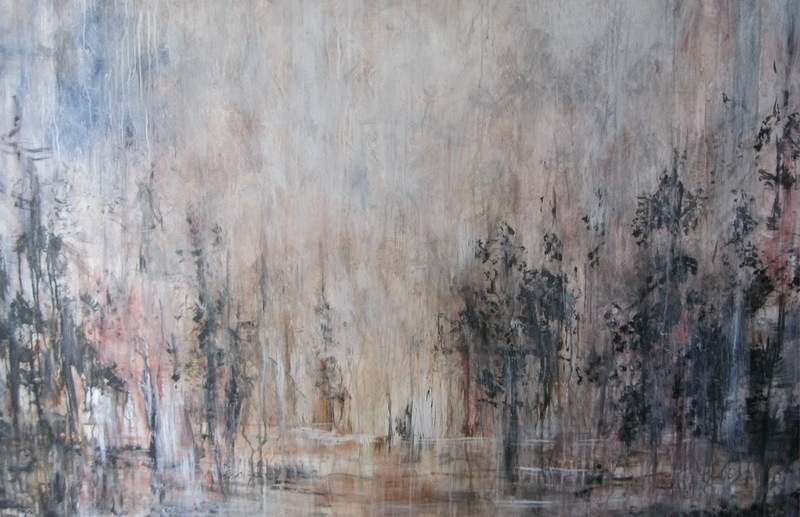 This painting is 4' x 5', gray-scale and desert tones, finished with a hint of cold wax. It's one of the most striking paintings I've ever done, with many layers. At different times of day, it changes as the light moves...late afternoon and evening brings the fire out from the background. ~ Walt Whitman, excerpt from "Song of the Open Road, I"